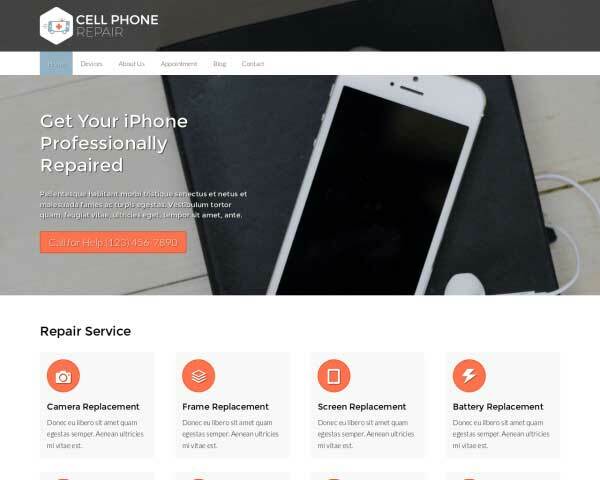 Make sure that potential clients can easily find information about the services they need from you by building a professional website for your business with the Cell Phone Repair WordPress theme. Just fill in your own text, photos and prices on this responsive, pre-built website template. 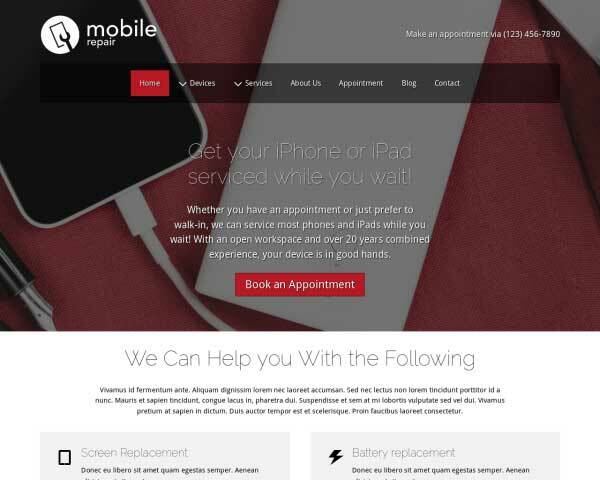 As a phone repair professional you know the importance of having an impressive online presence that gives clients confidence in your business. 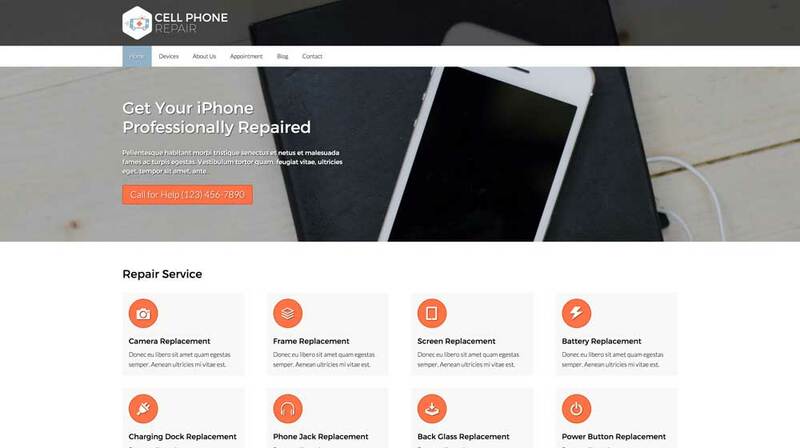 That's why we've designed the Cell Phone Repair WordPress Theme with a bright, clean layout and user-friendly navigation that helps you present your phone repair company in the best light. Just fill in your own text and images to offer visitors details about your services. No coding is required to customize your website with your signature colors, adjust page layouts or add features. Our unique front-end editor lets you style your site with just a few clicks, and drag and drop widgets make it simple to add or move blocks of content. This pre-built website template for IT companies comes with premium features that can be easily customized to suit your needs. 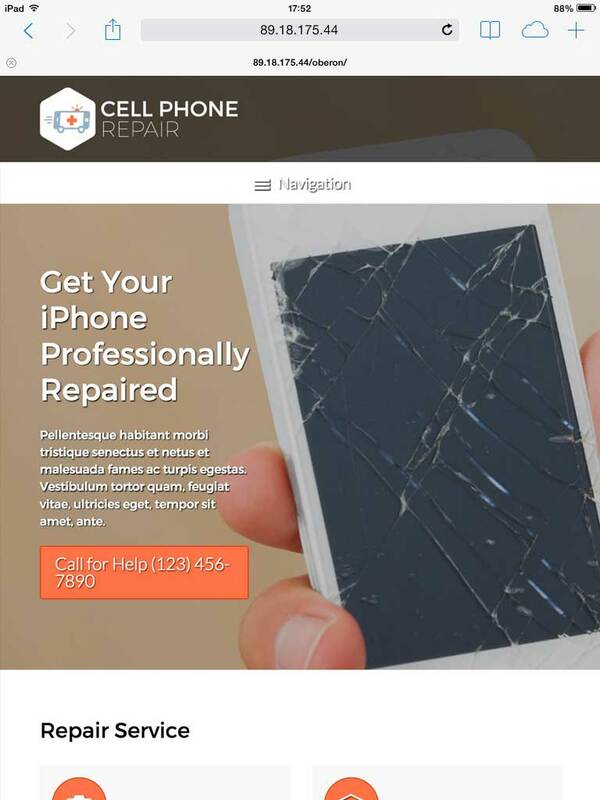 Take a look at the demo site and try it risk free for three days to see how the Cell Phone Repair WordPress Theme can help you boost your phone repair business with an exciting new website! Your website wouldn't be complete with a dynamic blog section. That's why we've included a turnkey blog, which will make it super easy to share tips and news about your business. 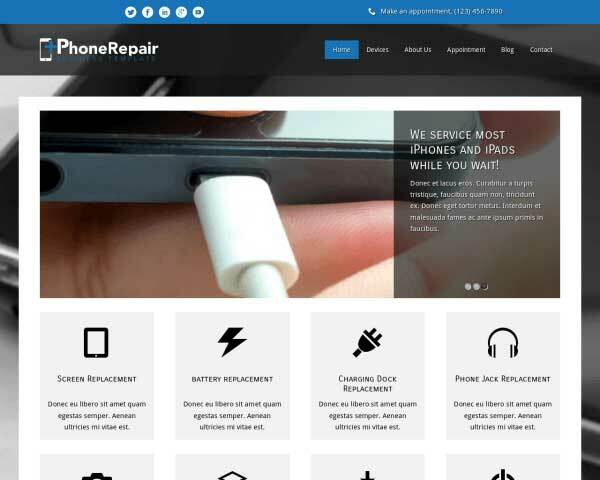 Show customers how to reach you on the Cell Phone Repair WordPress Theme's contact page, designed with helpful features like a customizable contact form and integrated Google map. 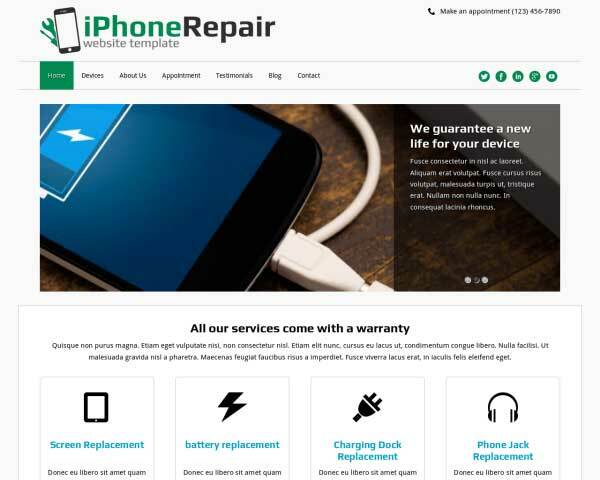 Show visitors a clear, visually-appealing overview of your prices for your services with the Cell Phone Repair WordPress Theme's convenient built-in rate charts. 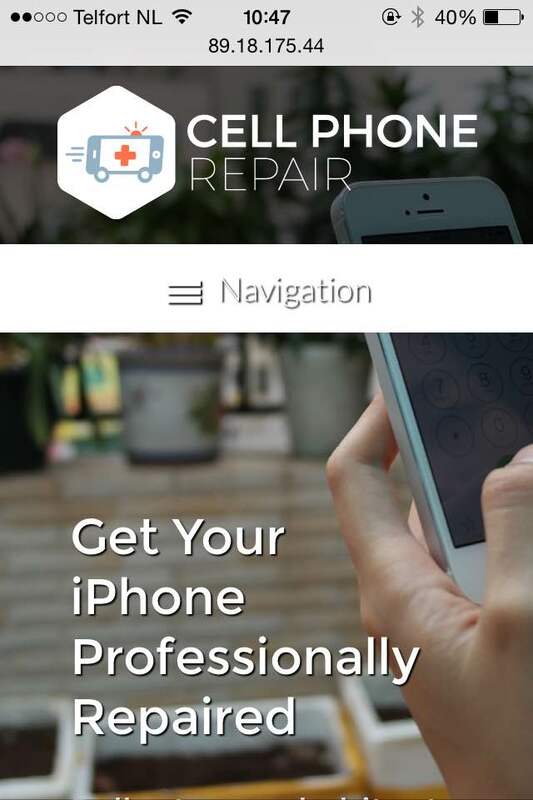 Allow your visitors to see an at-a-glance overview of your services, directly from the homepage of the Cell Phone Repair WordPress Theme. Their screens may be cracked and their batteries weak, but your customers will appreciate the great-looking, user-friendly mobile version of your website when they browse your pages on their smartphone and tablets. 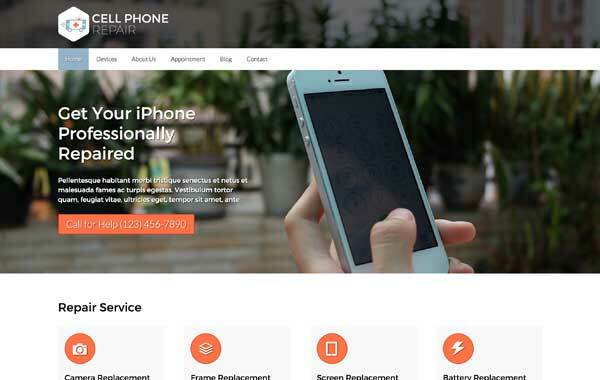 This responsive Cell Phone Repair WordPress theme features a mobile-optimized design that will display your content neatly based on the screen size of each handheld device. This happens automatically, so you won't have to bother with tedious coding or searching for plugins to ensure that your new website will offer mobile visitors the same professional design and intuitive navigation of the desktop version.